VALENCIA, Spain, June 15, 2011 (ENS) – Spanish art experts are employing bacteria to restore priceless 400-year-old frescoes in a church in the southern city of Valencia using a technique developed to restore equally precious frescoes in Italy. 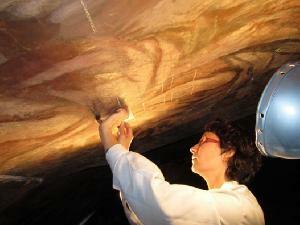 Spanish restorers are testing this new technique on the frescoes of Antonio Palomino from the 17th century in the Church of Santos Juanes in Valencia. They have shown that a special type of bacteria is capable of cleaning works of art in a fast, specific and respectful way as well as being non-toxic to the restorer or the environment. The team that completed the tests are from the Institute of Heritage Restoration and the Centre for Advanced Food Microbiology, both from the Polytechnic University of Valencia. These developments were announced at a recent seminar held at the Polytechnic City of Innovation, which was attended by the Italian creators of these techniques using bacteria. One of Italy’s leading restorers, Gianluigi Colalucci, who restored the Sistine Chapel, and his colleagues have shared their expertise with the Spanish restorers working on the murals of the Church of Santos Juanes. Colalucci and colleague Carlo Giantomassi had applied the technique, developed by Italian microbiologist Giancarlo Ranalli, in their restoration of the wall paintings of Campo Santo di Pisa, next to the city’s famous Leaning Tower. The microrganism selected by the restorers is part of the Pseudomonas family and it has been converted into a gel for the works. “The frescoes on which we are using it were damaged after the Second World War,” Giantomassi told the seminar participants. In the past, to remove foreign materials encrusted on ancient artworks restorers used reactive chemicals that are non-selective and toxic. Or they tried to wear away the crust by mechanical means, which is time consuming and can damage the paint. The Valencia project began when the Institute of Heritage Restoration was working with the murals of the Church of Santos Juanes, which were virtually destroyed after a fire in 1936 and were improperly restored in the 1960s. The researchers had difficulty dealing with salt efflorescence, the white scabs caused by the buildup of crystallized salts and the enormous amount of gelatine glue remaining on the pulled-off murals. So microbiology professor Rosa Maria Montes and biologist Pilar Bosch travelled to Italy to learn from the originators about their work using bacteria to remove foreign matter from Italian artworks. “By the action of gravity and evaporation, the salts of organic matter in decomposition migrate to the paintings and produce a white crust hiding the work of art and sometimes can also cause the loss of the painting layer,” says Bosch. Back in Valencia, the Spanish team say they “trained” the most suitable strain of Pseudomonas bacteria to literally eat the saline efflorescence found in the lunettes of the vault behind which pigeons nest. The Spanish scientists reduced the application time and created a new way of using the bacteria. “After an hour and a half, we remove the gel with the bacteria. 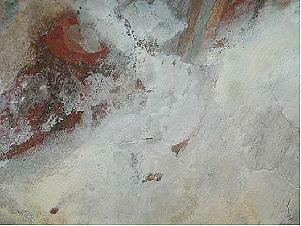 The surface is then cleaned and dried. Without a wet environment, the remaining bacteria die,” he explained. The new method has been tested on two lunettes of the vault in the Church of Santos Juanes and scientists expect to apply it on another two. The Valencia research project was funded through the R&D support program of the Polytechnic University of Valencia and concluded with Bosch’s doctoral thesis, which received a grant from the Spanish Ministry of Science and Innovation. The scientists are considering partnerships with private businesses.